healthy heart subzis. Whether your staple is rice or rotis, whichever part of the country you are from, you will agree with one thing -- subzis have their own special place in any Indian meal! Being a daily affair, it becomes very important to make subzis healthy and nutritious, to suit the needs of a healthy heart. This section will show you ways to make a range of nutritious, low-calorie and appetizing subzis using a variety of heart-friendly ingredients and cooking methods, which will satisfy your taste buds and your nutrient requirements. These recipes highlight the use of ingredients like colourful veggies, sprouts and low-fat paneer prepared using apt cooking methods, to help you stay fit forever. Paneer Palak Koftas in Makhani Gravy is a unique recipe where pumpkin along with tomato is used for preparing the gravy while avoiding the addition of fat like butter or cream. Also the koftas are steamed instead of deep fried. Hariyali Mutter is a nice green subzi prepared using green peas and paneer, loaded with protein, fibre, calcium and vitamin A that supports heart health. Ever thought about combining pulses with paneer? Chana Paneer is another innovative recipe rich in heart friendly nutrients like Thiamine, Calcium, Magnesium and Phosphorus. Enjoy this simple Gavarfali ki Sukhi Subzi with your favourite phulka or roti. The fibre rich cluster beans taste is improved by heart friendly garlic known for its heart health benefits. Masala Karela is another dry subzi great for heart health ofcourse because it contains bitter gourd but also cauliflower that has many health benefits. Pyazwale Mutter even though it’s a low calorie subzi, it is a really good source of protein and fibre. The tomatoes in it will add antioxidant lycopene which has a heart protective effect. 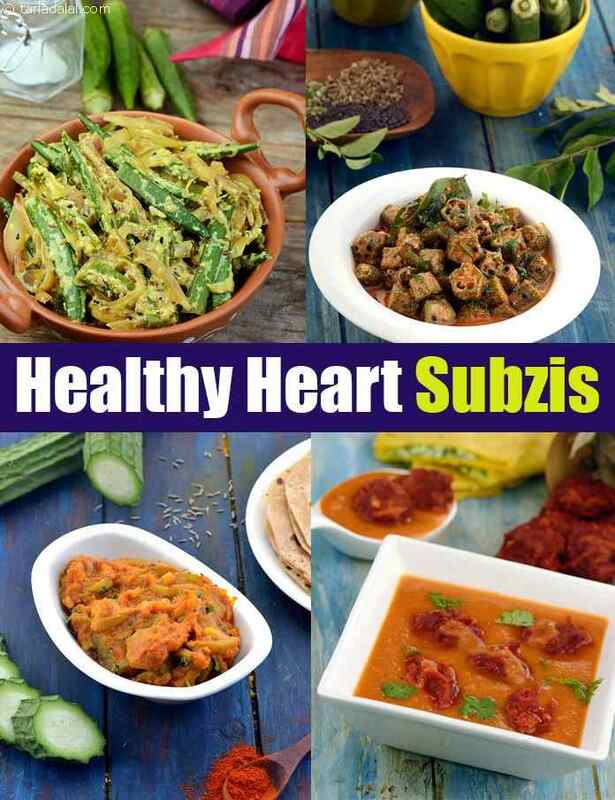 Enjoy our healthy heart subzis and healthy heart recipes article below. There are dozens of ways of cooking mutter, but this one truly tingles the tastebuds thanks to dominance of coriander in the masala. Hariyali Mutter comprises healthy ingredients and cooking methods, thereby strengthening the heart and controlling blood glucose levels too. One of my personal favorites!! this subzi has an unusual mix of ingredients, with the potassium-rich chana and tomatoes making it ideal for people with high b. P.